Get ready nail polish lovers! 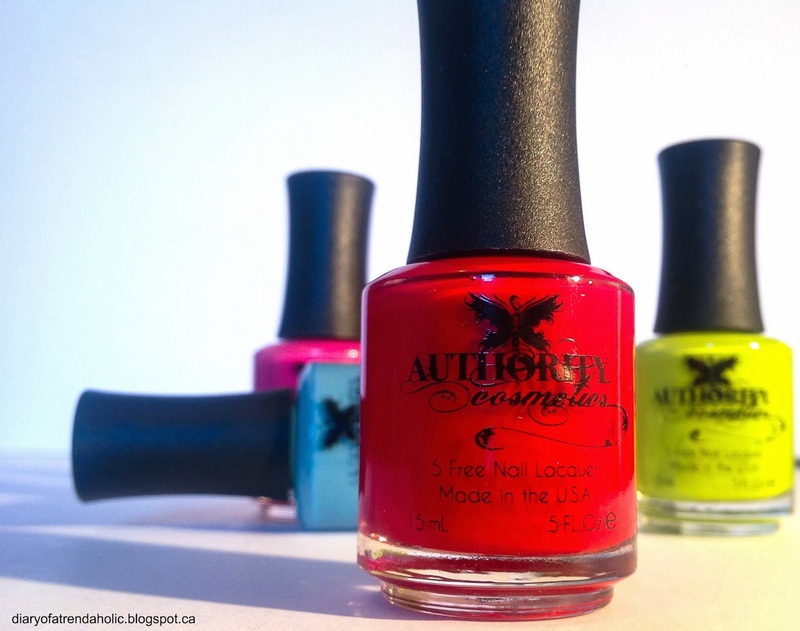 Today I have an exciting review and giveaway on Authority Cosmetics nail lacquer. After realizing that my love of polish and continuous manicures was wreaking havoc on my nails and causing them to peel, I decided to search for brands that used fewer chemicals. Authority Cosmetics offers 10 gorgeous shades of lacquer that are free of: formaldehyde, DBP, toluene, camphor and formaldehyde resin making them less toxic and a safer choice. These nail lacquers come in cute packaging and the bottles are large! 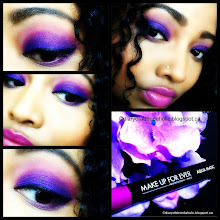 You can find colors for any season or occasion and there is a nice selection of vibrant, fun shades to choose from. I found that some of the shades do stain heavily while others don't stain at all. I recommend applying a base coat, two coats of lacquer and a top coat. The formula is wonderful and not prone to those pesky little air bubbles which I find frustrating. The polish is easy to work with and the brush is standard size but good quality. I like that the colors dry quickly and touch-ups are a breeze. 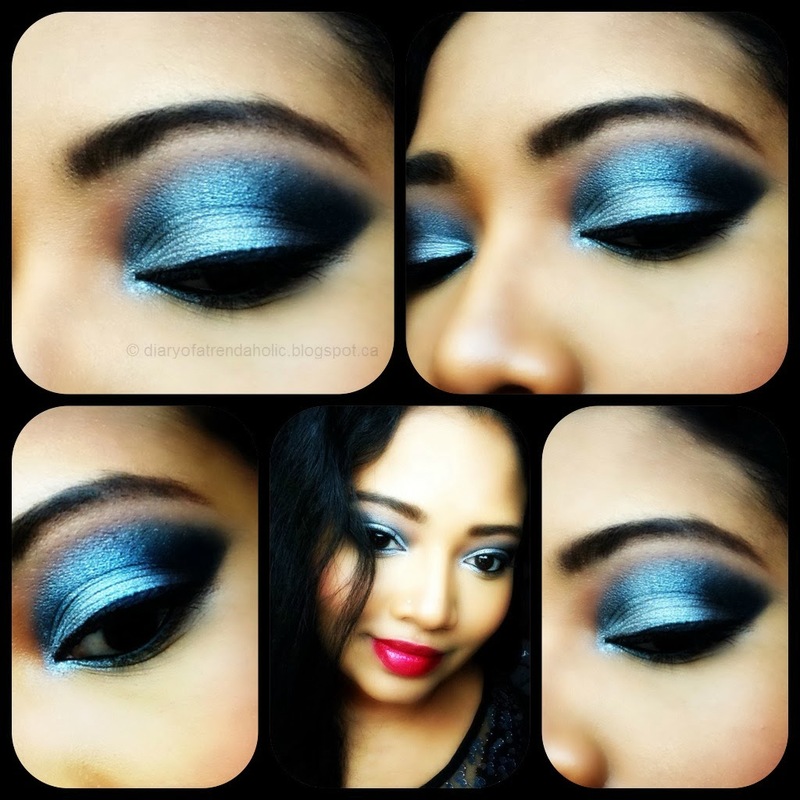 The shades are rich and apply beautifully opaque and glossy. In sunlight, they make my nails standout and look fabulous! With a good top coat the lacquers can last quite a while before chipping. Saint Valentine is a deep, vibrant red suitable for everyday wear and as the name indicates perfect for Valentine’s Day. Red lacquer is classic and never goes out of style. This is one of my favorite shades in the line! Paradise is a light, milky sky blue that reminds me of Easter and spring in a bottle! Gumdrop is a beautiful, true pink great for all seasons and everyday wear. This color is also pretty for a bright pedicure. Disco is a bright lime green that just screams summer fun! 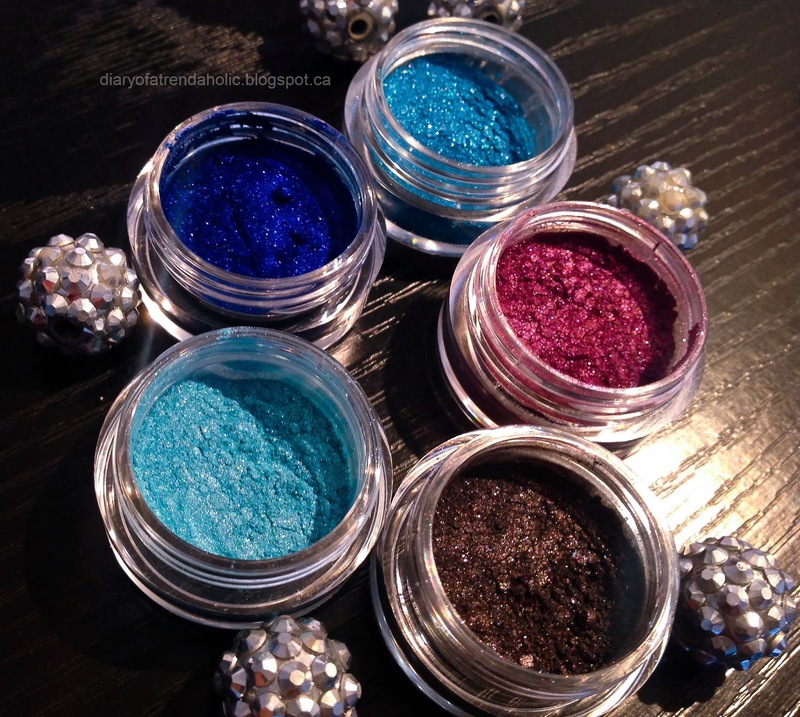 Authority Cosmetics also offers a metallic collection and the shades can be purchased separately or at a group rate. This set of polish is deeper than the shades above and have a stunning duo-chrome effect. Each polish retails for $14 and the metallic collection is on sale right now for $35. Enter for your chance to win these TWO gorgeous nail lacquers! 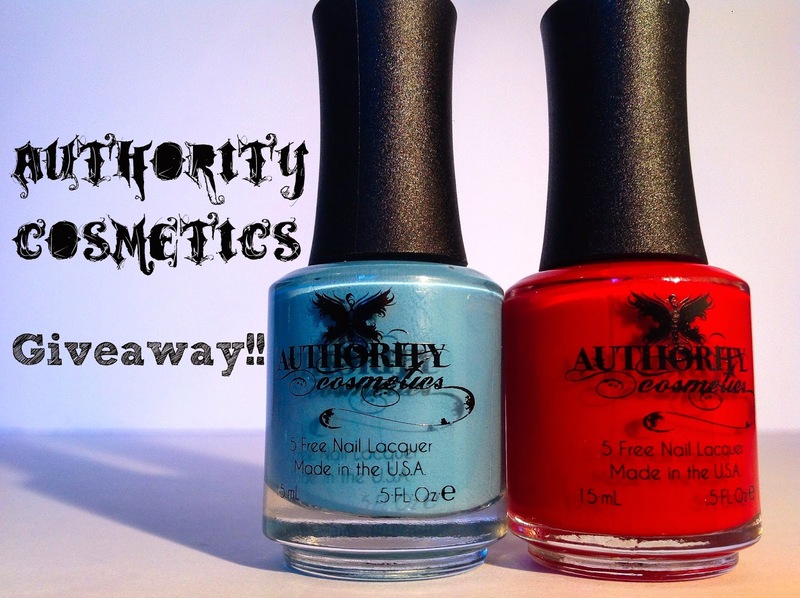 Because I am obsessed with these alluring lacquers, Authority Cosmetics and I have decided to host a giveaway for everyone! This giveaway is open internationally and will run for one month at which time a random winner will be selected. One lucky winner will be receiving two bottles of nail polish: Paradise & St. Valentine. Please be sure to read the rules below and enter correctly as outlined via Rafflecopter. Some forms of entry into the contest are allowed daily so get those entries in and good luck everyone! 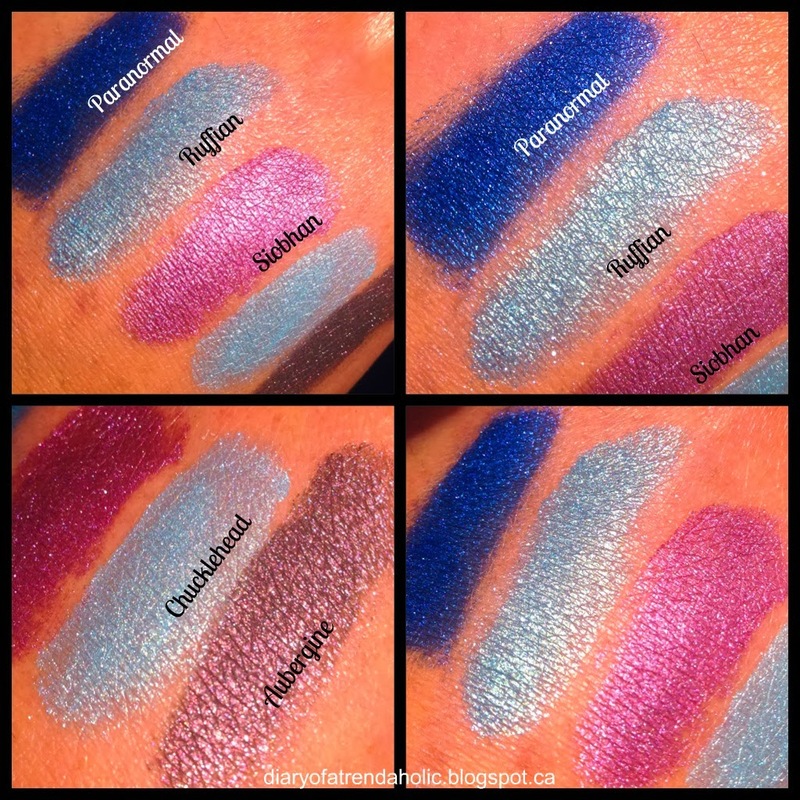 This giveaway is sponsored by http://www.authoritycosmetics.com/ and hosted by Diary of a Trendaholic. It consists of 2 full sized bottles of nail polish valued at $24. The winner will receive the colors Paradise and St. Valentine. All entrants must enter correctly and provide the necessary information as outlined via Rafflecoptor. Only viable entries will be considered. This giveaway is open internationally and will run for one month beginning on Tuesday April 1st at 12am and ending on April 30th at 12am Eastern Time Zone. 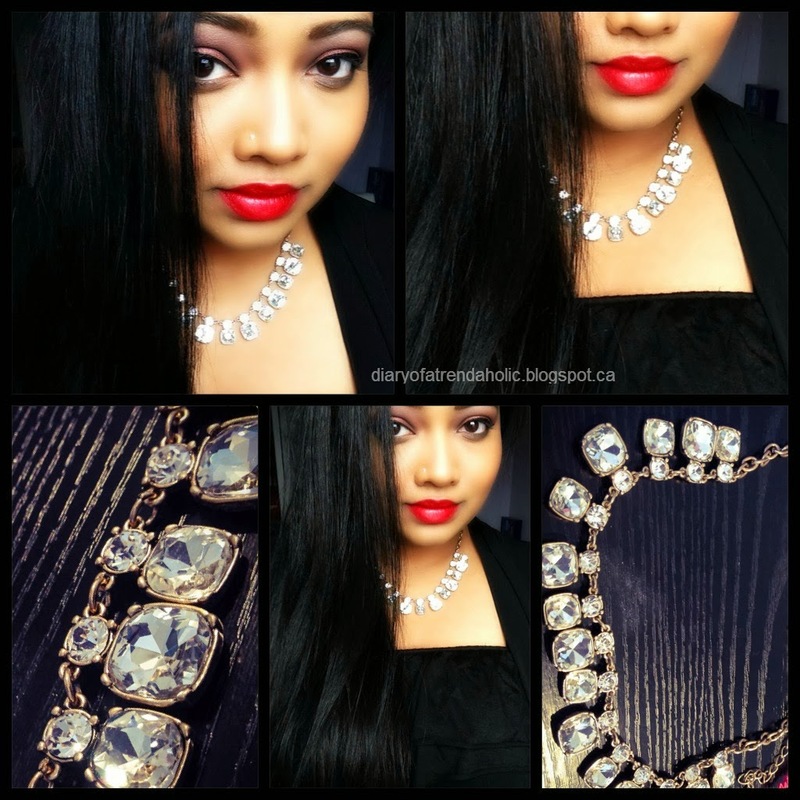 One eligible winner will be chosen at random and announced on http://diaryofatrendaholic.blogspot.ca/. You must be at least 14 years of age to enter. Entrants under 18 must have permission from parents/guardians. The winner must send their mailing address (no PO Box addresses) and contact information to diaryofatrendaholic@outlook.com to receive the prize. Winners will also be contacted by email if an email address is provided upon entering. In the event that the winner does not claim the prize within one week a second winner will be chosen at random or another thereafter until the prize is claimed. Diary of a Trendaholic is not responsible for a lost package, delays, damages or any other issues that occur during shipping, handling or mailing. Good luck! 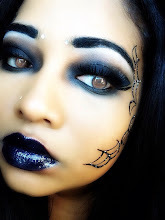 Today I have another quick makeup look to share. 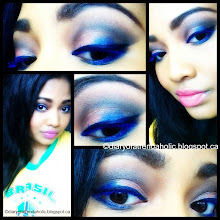 This is a simple look I created while playing around with the Coastal Scents 120 palette (palette 2 on the website). 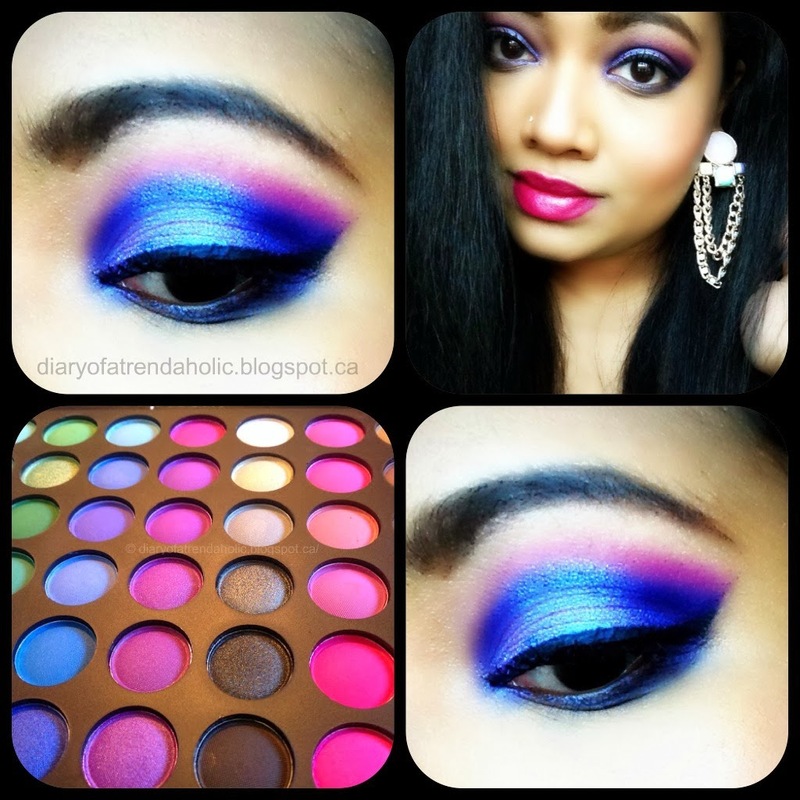 I was asked by some readers to show more ways to use this palette and I like how these colors compliment each other. For the lid color I used a combination of the top three purple/pink shades in the 1st tray (4th row from the right) and the very last dark purple on tray 2 (4th row from the right). 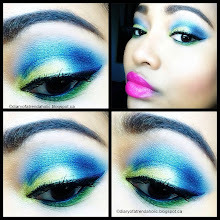 These colors are bright, saturated and bold, a great way to kick off spring! 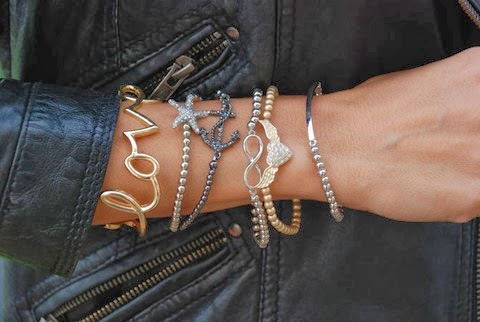 Nothing dresses up an outfit like stunning jewelry. Accessorizing with the right pieces can add stylish flare to even the plainest outfit and create an eye catching fashion statement. 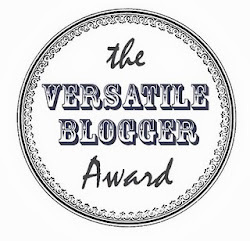 Today I have a review on a wonderful subscription service for all you accessory lovers. 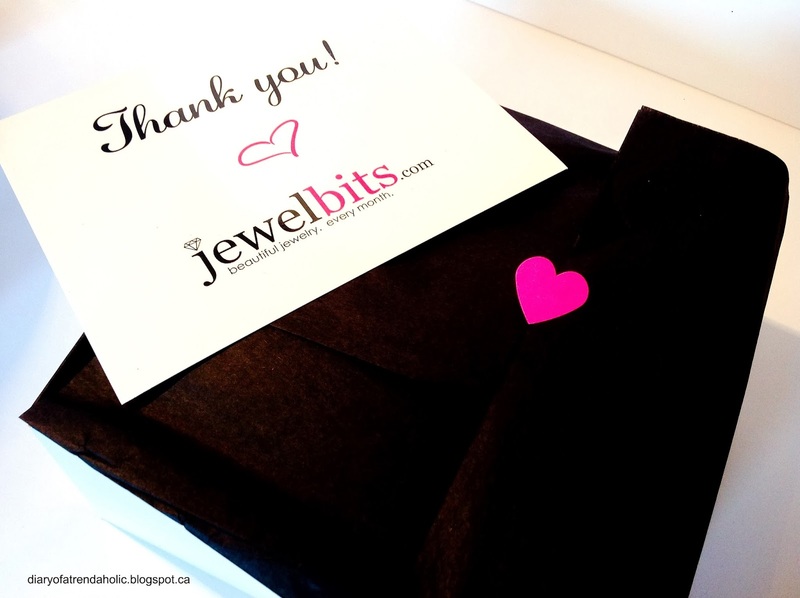 Jewelbits is a subscription services that acts like your own personal shopper based on the style you choose from the website. They deliver 2-4 boutique style pieces to your door every month that can be worn separately or together. Jewelbits offers 3 payment plans to chose from. One month costs $39, three months is $37 (per month) and if you sign on for 6 months each box cost $33. Shipping to The U.S is free and shipping to Canada is an additional $10. Each style category has examples of the type of jewelry you will receive so you can browse through and see what you like. 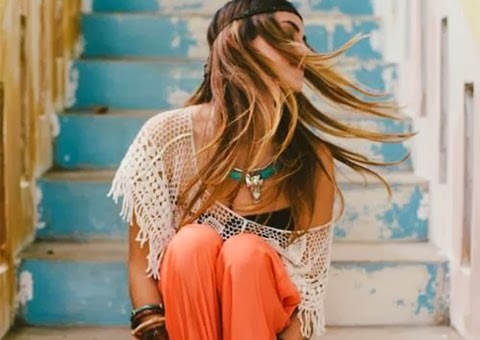 You can also change your style category at any time. 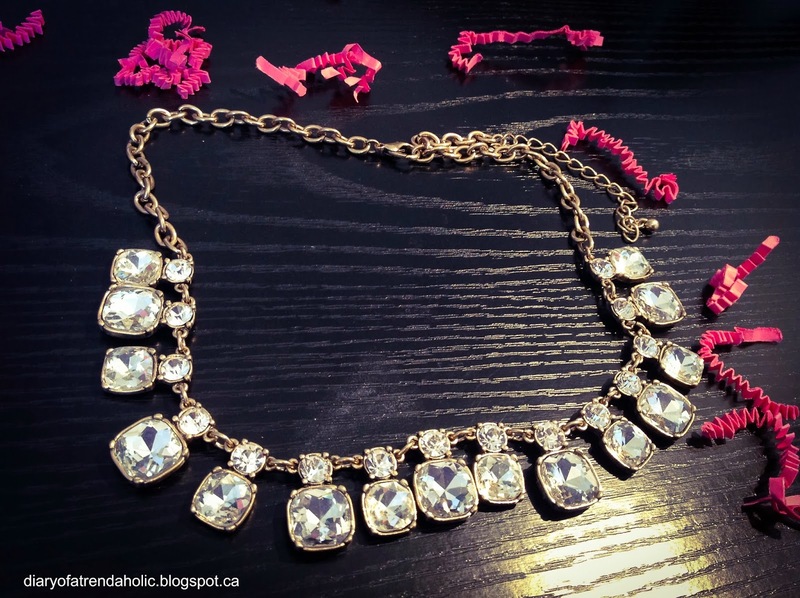 The style I chose was Glam Gal because I prefer sparkle and lavish, show stopping pieces but I also like the "elegant, romantic jewelry" in the Classic category. The items came packaged in a cute box, wrapped in pink feminine paper which makes it a great gift idea. In fact you can also gift your box to someone during your subscription period. 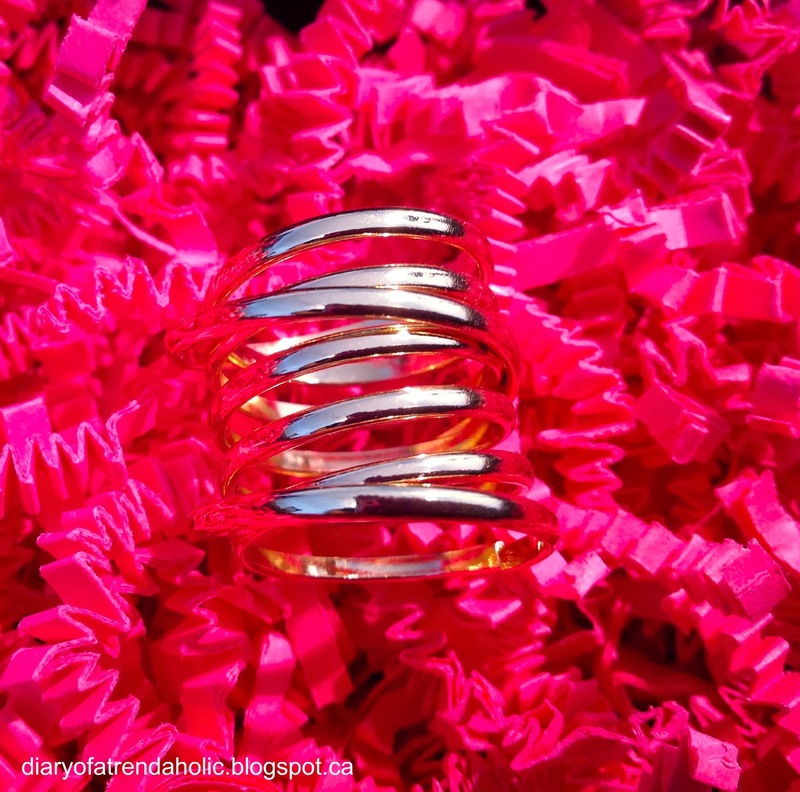 The box I received contained three pieces of dazzling jewelry. I did find that the category I chose coincided with my personal style and I love all the pieces! 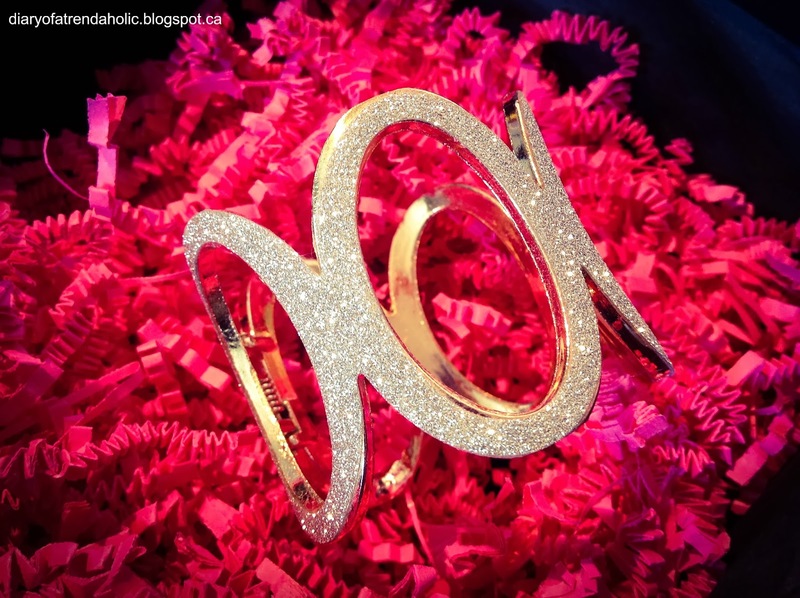 The first item is this gorgeous cuff style bracelet. The shape and unique design coupled with the elegant sparkles makes it a great piece for formal occasions and fun parties. The clasp on the bracelet is sturdy and I like that the glitter doesn't come off and transfer. 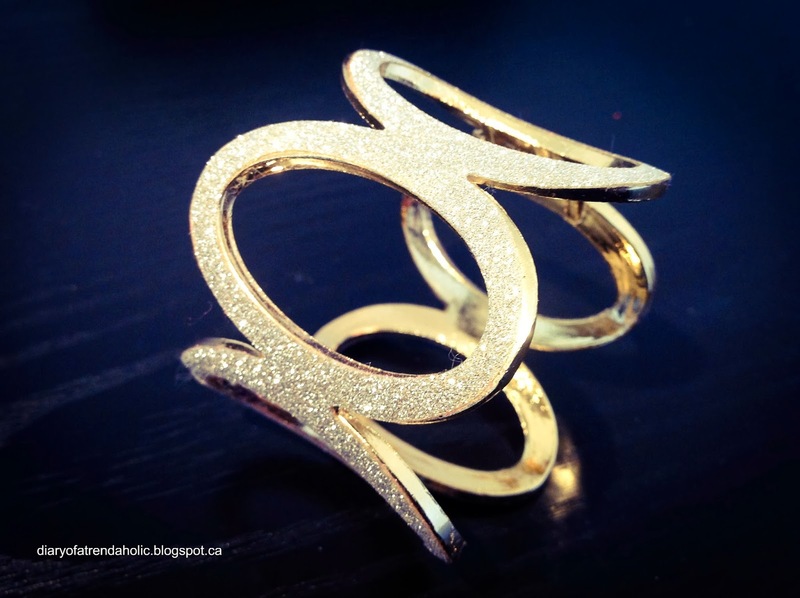 This is definitely a bracelet that would catch my attention if I was strolling through a boutique. 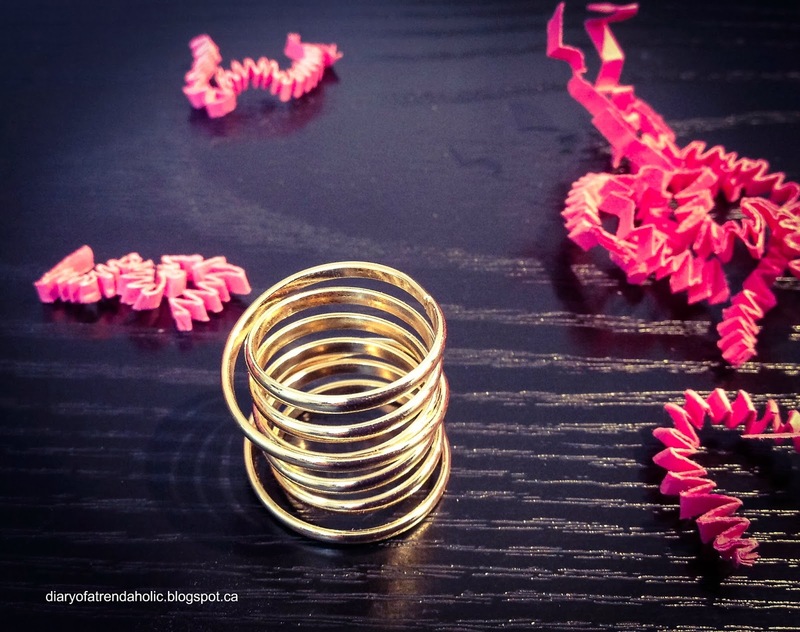 The next item is this gold colored coil ring, great for every occasion. I like that it looks like 7 separate rings with intertwining bands. It doesn't seem to be adjustable but fits comfortably on my middle finger. 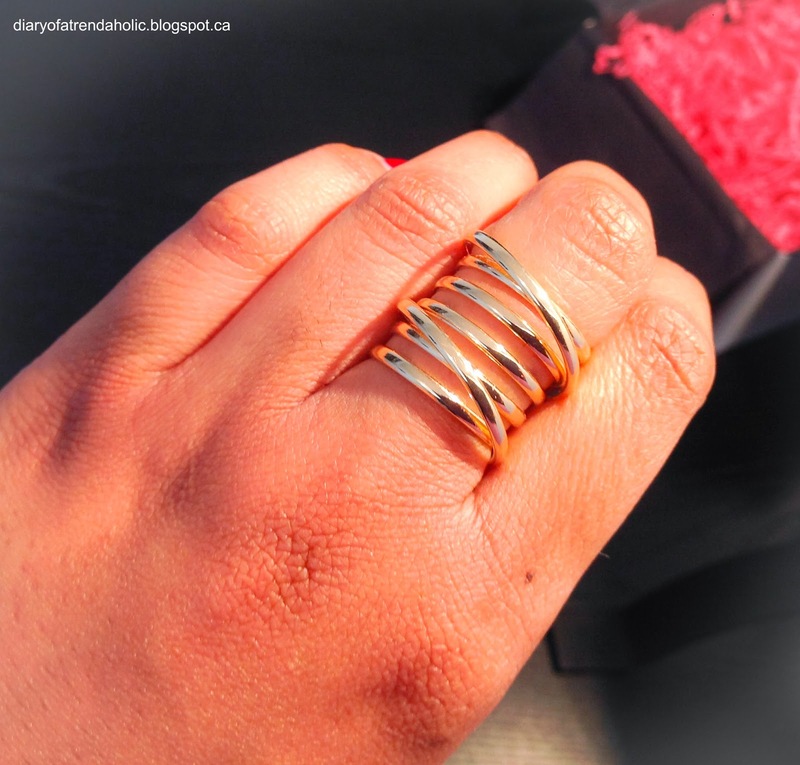 It is simple yet interesting and stacked jewelry is very trendy right now. The last item is my favorite! 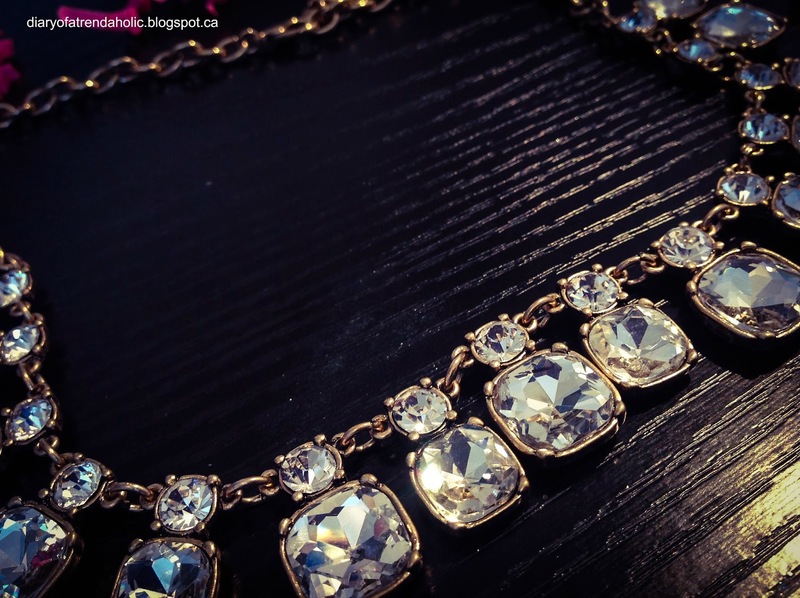 This glamorous necklace is a great statement piece, in fact I recently wore it to the ballet Swan Lake which was a formal event. Paired with a simple blouse it also works with office attire or casual, stylish outfits. It can be worn as a choker or adjusted to hang lower and the chain is durable. I love the design and the large exquisite jewels that hang and sparkle. I like that the box included a variety of good quality, beautiful pieces. All the items fit me well but if you have concerns with sizing or with certain metals you may want to consult the company. Overall I really like this subscription service. It is great for revamping your jewelry box and acquiring unique pieces to build a versatile and captivating collection. Ice cream is my favorite desert; the cool creamy treat can help relieve the relentless humidity of summer and even during the frigid winter I can't seem to resist it. I love topping it with candy and fruit and I even enjoy the different varieties from India and Italy. Even though ice cream is delicious it is quite fattening if consumed often so my family decided to purchase one of the healthiest, easiest ice cream machines on the market. 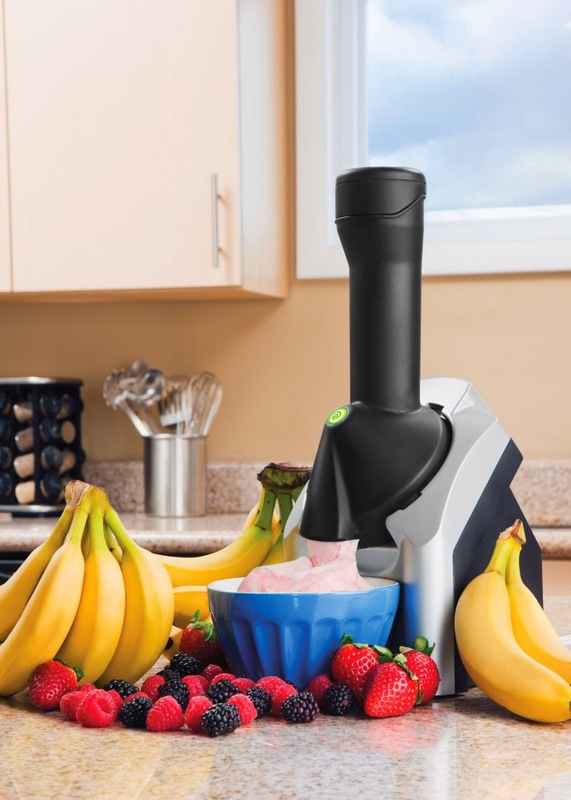 Yonanas is a machine that makes creamy ice cream using nothing but frozen fruit! Yes you read that correctly! The recipes require no dairy or added sugar! All you do is toss in your favorite frozen fruits, push the plunger down so the fruit goes through the machine (similar to a juicer) and you have a delicious dessert ready in minutes! You can experiment by adding your favorite toppings like cookies, chocolate and peanut butter. 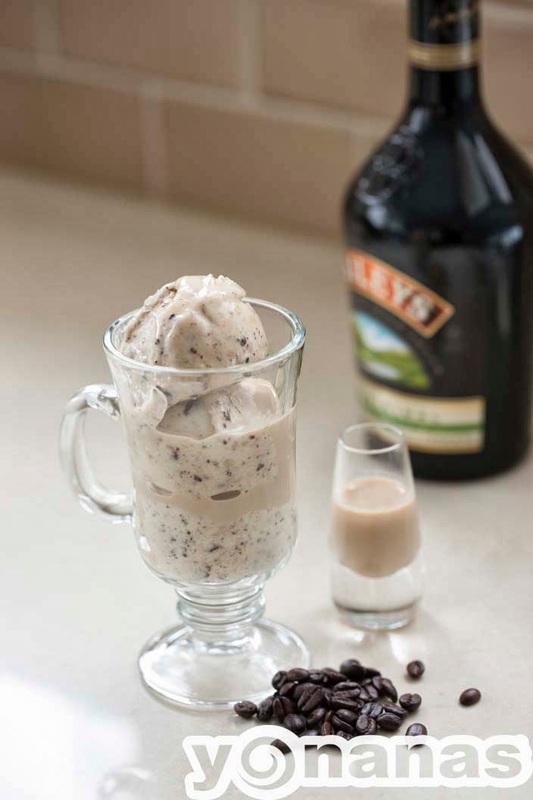 You can also create delicious adult recipes such as Irish coffee, perfect for a girls night in! Although the name is quite silly the machine works well and doesn't take up much room on the kitchen counter. It is also dishwasher safe and relatively easy to clean. The Yonanas machine comes with a recipe booklet with lots of ideas for creating healthy, frozen desserts and you can also find many great recipes on the website. Bananas are a key component for the ice cream recipes because they give it a creamy texture. If you don't care for bananas however you can also use the machine to make scrumptious sorbets. We buy fresh fruits and freeze them or we purchase bags of frozen fruit, the same variety used in smoothies. You do need to leave the fruit out for a few minutes after removing it from the freezer. The amount of time you allow the fruit to sit will determine the texture you end up with so experiment to find your desired consistency. This is a fantastic way to get in all your servings of fruit and fill up on beneficial antioxidants without feeling like you are eating healthy! I think it is great for families. 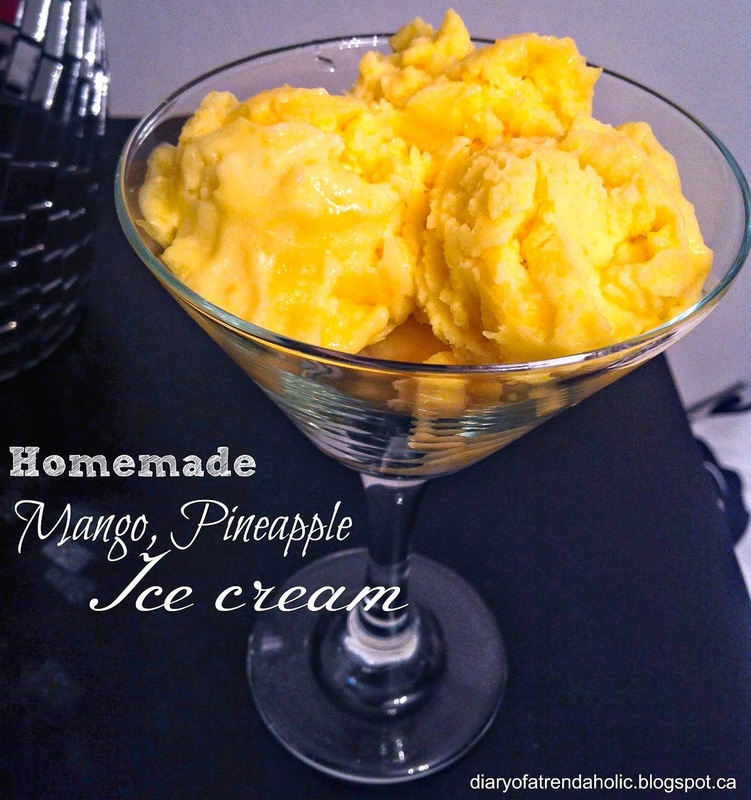 Over the weekend my sister and I made some mango, pineapple, ice cream. It was quick, easy and tasted fresh and delicious. You can also add yogurt to make homemade froyo! We got our machine at Walmart for $48 and if you want to check out the website you can find it HERE. I think my next recipe is going to be Bailey's ice cream with chocolate and strawberries....I'll let you know how it turns out! 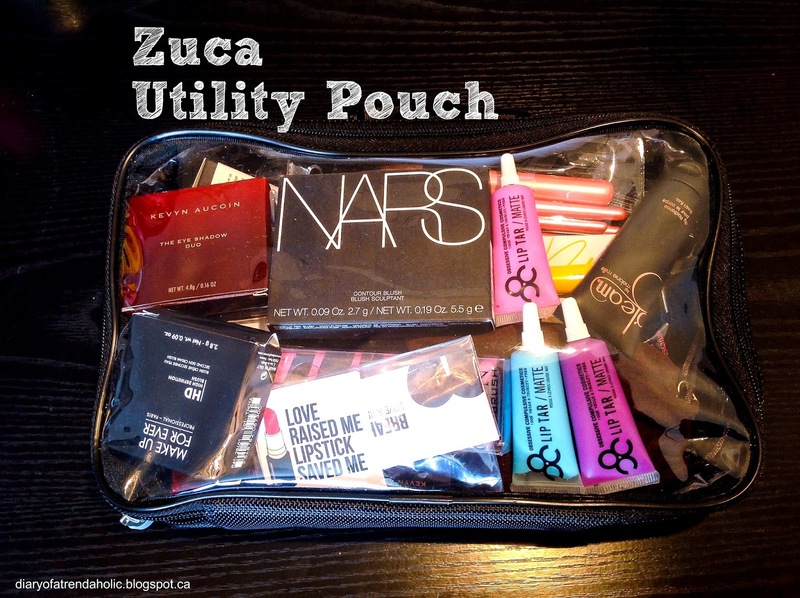 On my recent trip to L.A I decided to try out the Zuca utility pouch. 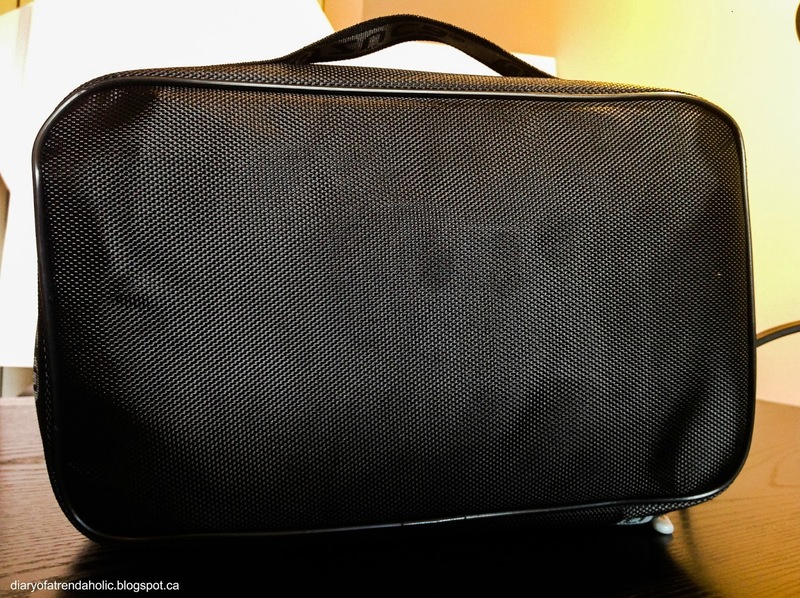 It is a great size, good quality and saved some much needed space in my luggage. Because I travel a lot I like to have a good makeup bag for organization and enough space to fit all my essentials.I was actually quite surprised at how much I could get into this simple pouch. On the last day of my trip I had quite a few beauty items to pack. 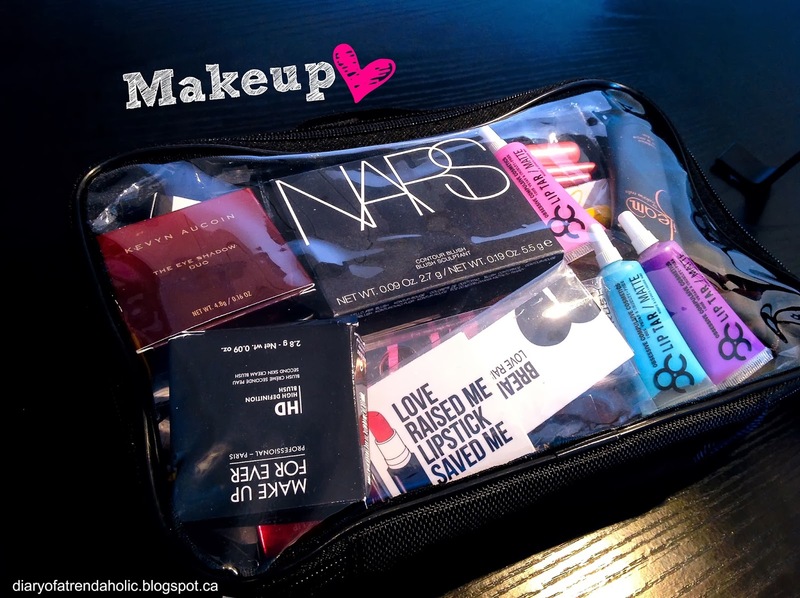 I went on a little shopping spree at The Makeup Show, Target, Ulta and MAC and despite having twice as much makeup as I did at the beginning of my trip this pouch was able to accommodate everything in a tidy manner. 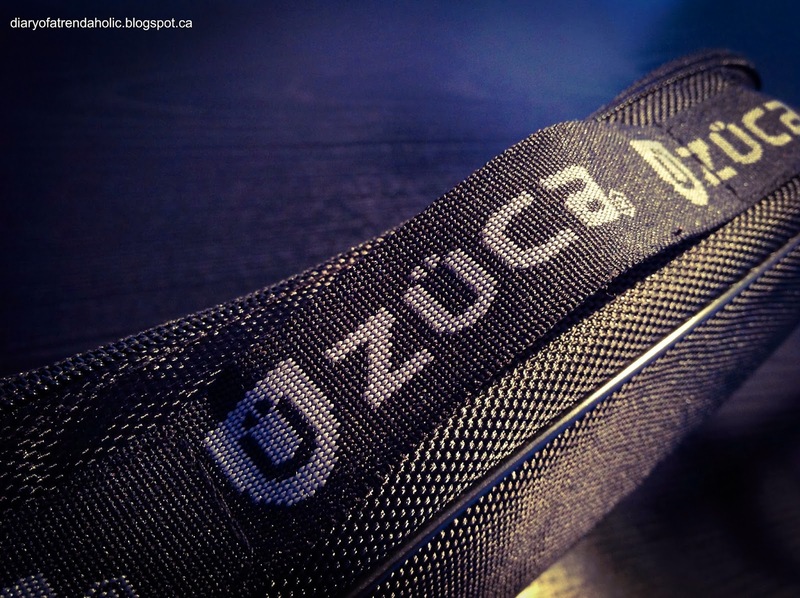 Zuca is a brand that manufactures all types of fun, colourful organizers and travel cases for a variety of purposes. They sell everything from sports collections, collections for kids, travel, artist’s collections and even collections for pets! The pouch also has a handle at the top for easy carrying. This pouch that I am using as a makeup bag retails for $15. I like that the front panel is clear so you can see all your neatly packaged items and the inside is lined with plastic which is ideal for easy clean-up. This is a great pouch to use for other travel items as well such as skin care essentials, hair styling tools and toiletries. I think it would work well for both men and women. If you want soft supple lips then lip care is essential and finding a lip product that works for you can be a challenge. When I was a kid I use to buy lots of interesting balms that came in bright colors and weird flavors. Now that I am an adult what’s inside matters more to me than what’s on the outside so I look for products that have natural ingredients that sooth and prevent chapped lips. 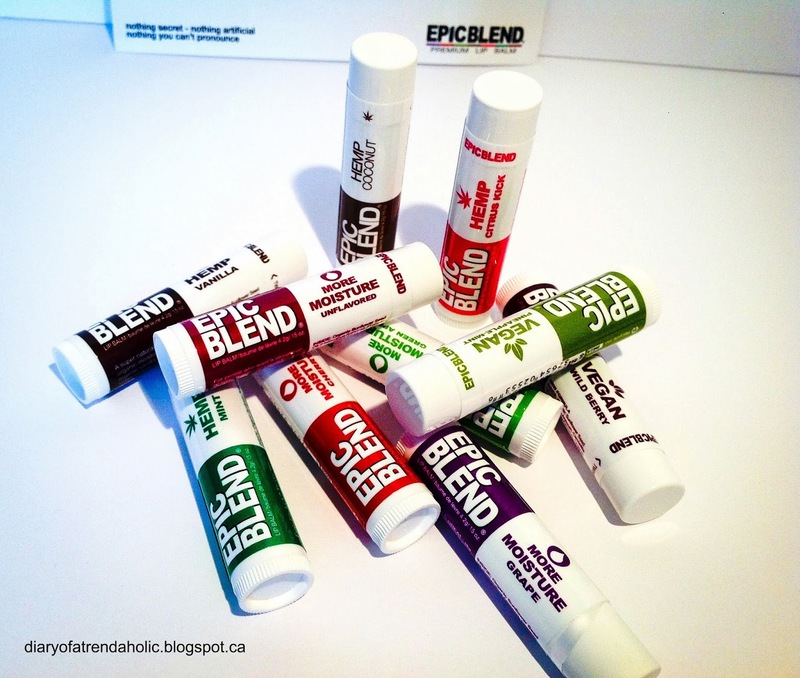 I keep a lip balm in almost every room of my house so when I came across Epic Blend I was happy to try their great selection of lip products. 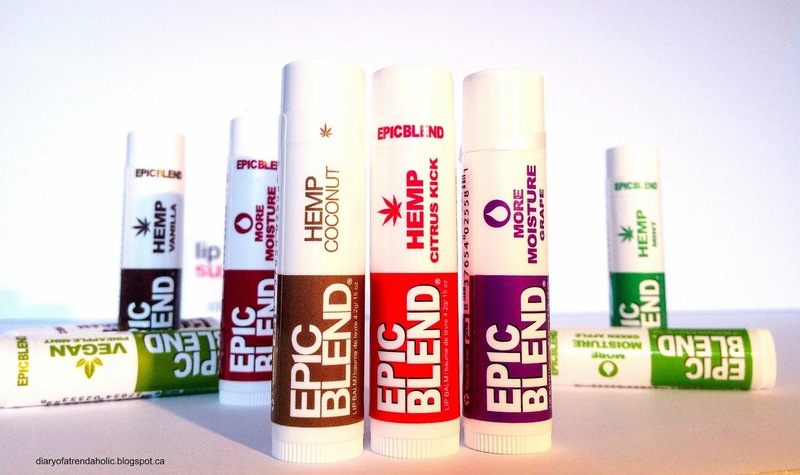 Epic Blend is a company that focuses on making lip balms for everyone using natural ingredients. They have a few different lines within the brand including: hemp balms, vegan balms and moisture balms. They also offer limited edition exotic flavors like banana and chocolate rum. I received the Lip Lovin Super Pack which includes a variety of 10 balms from each of the lines. 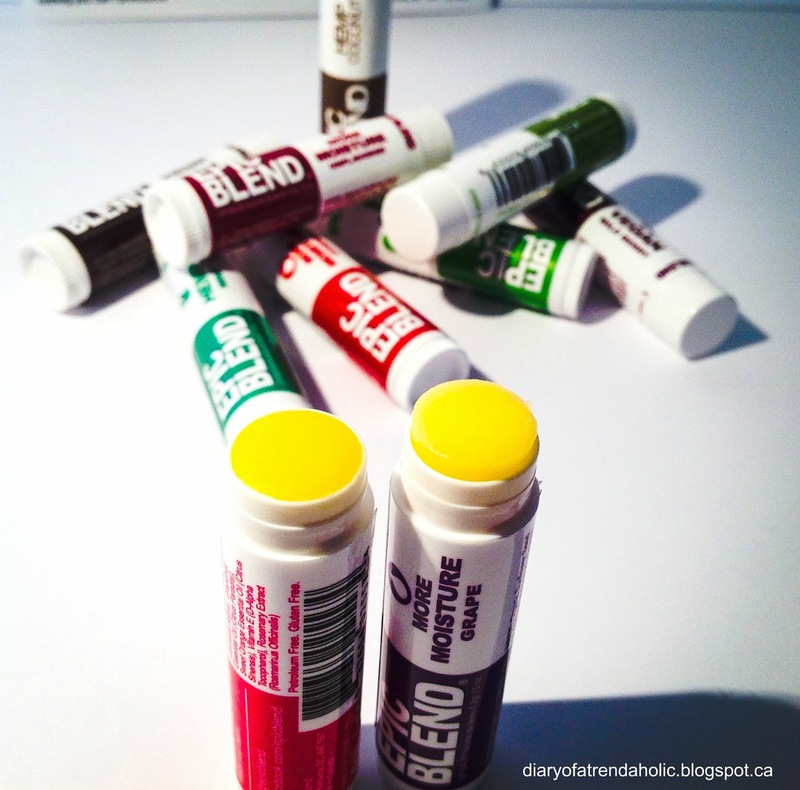 The scents and flavors of these lip products are tropical and smell delicious! I have: grape, wild berry, mint, vanilla, cherry, citrus kick, coconut, unflavored, green apple and pineapple mint. The lip balms contain ingredients such as: sunflower seed oil, organic beeswax, organic cocoa butter, organic coconut oil, organic hemp seed oil, vitamin E and rosemary extract. Because the ingredients are organic and natural, irritation of the skin is less likely to occur. I like the formula of these products because unlike some organic balms that can be thick and hard to apply these glide on smoothly and feel hydrating on the lips. They help relieve dryness and the natural oils provide great moisture. I do find myself re-applying often but the balms improve the texture of my skin. 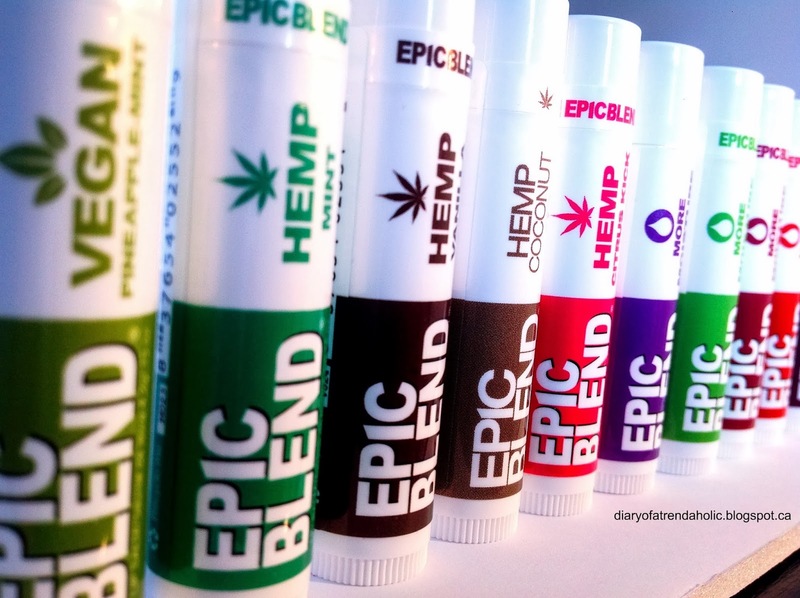 I have my Epic Blend balms stashed away in my car, my bedside table, my office and in my purse. After a harsh winter our lips can use all the help they can get! 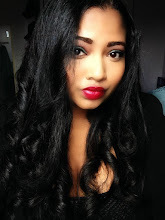 Spring is a great time to revitalize the lips and get them ready for all the beautifully bright lipsticks. I gifted some of these balms to members of my family and they were a hit with everyone. 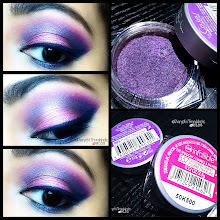 On my hunt for more beautiful eye shadows I came across a brand called Silk Naturals. This company strives to use more natural ingredients and offers gluten free and vegan options. After testing these shadows I can confirm that my hunt was a success! 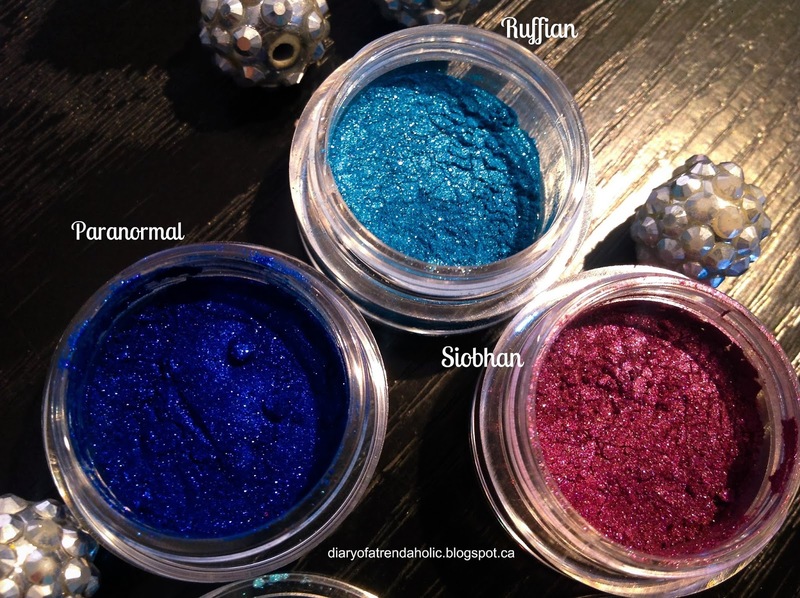 The loose mineral shadows from Silk Naturals are stunning, bold, highly pigmented and great quality. 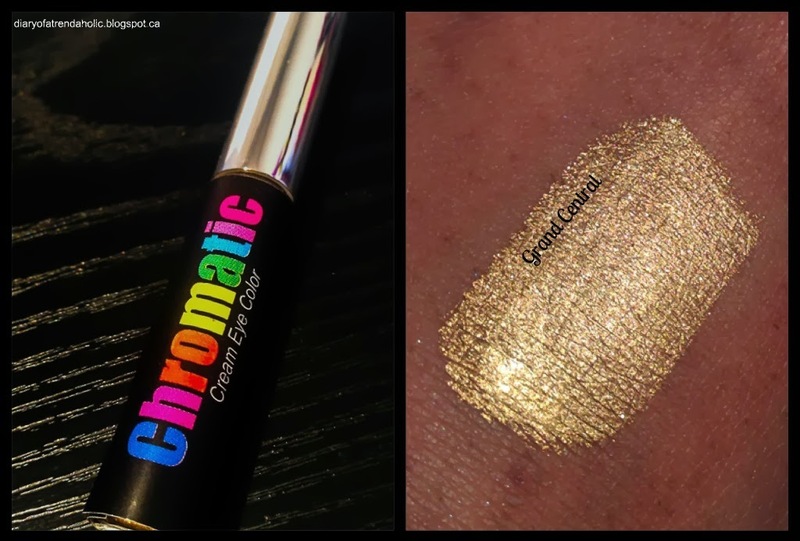 The website offers an impressive 300 colors to choose from and although the swatches online are a bit one dimensional you will be pleasantly surprised at how dazzling the shadows are once they arrive. The shadows come in 5g jars and retail for just $4.50 each. 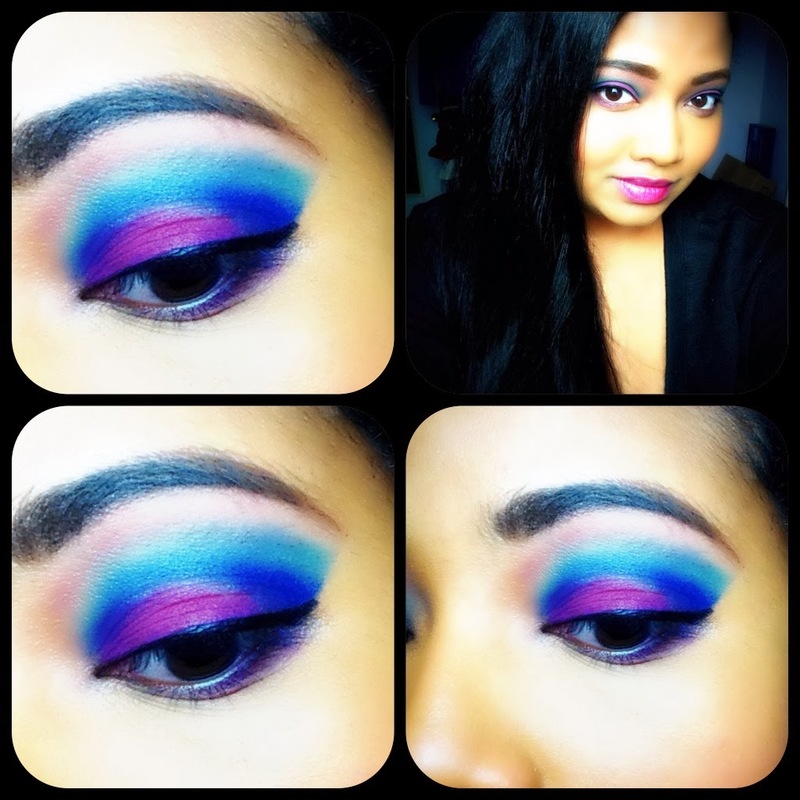 The colors adhere well to the skin so they are easy to work with and highly buildable. Tip: I suggest applying these shadows before the rest of your makeup to avoid fall-out getting stuck in your foundation or face products. 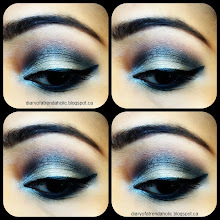 Use a flat eye shadow brush and pat the color onto the lids for more precise placement and tidier application. 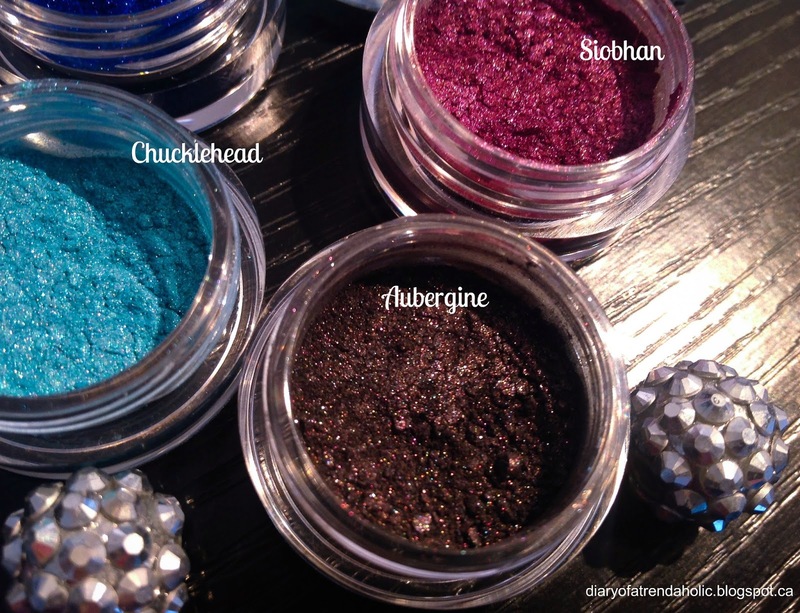 I usually find loose eye shadows to be more pigmented than pressed shadows so they tend to be my favorite to work with. 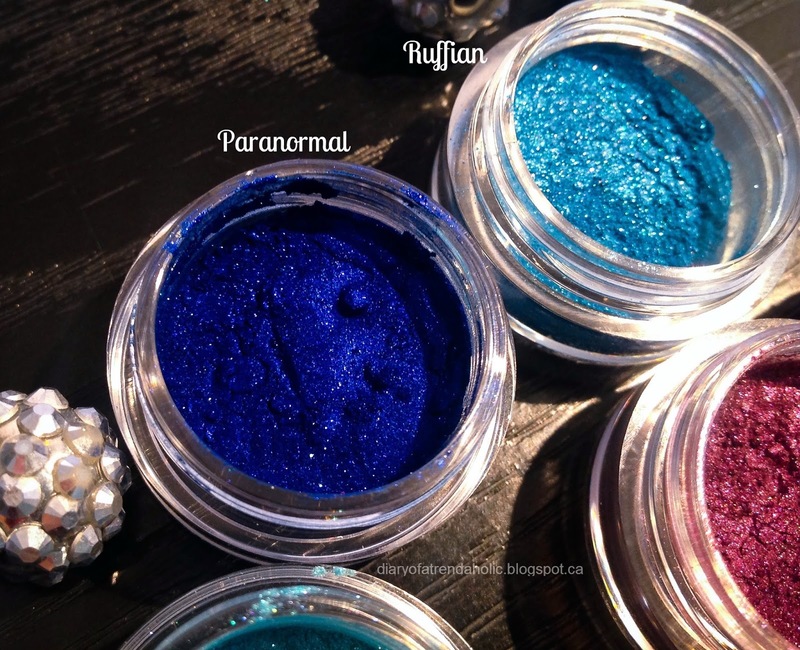 The color Paranormal is one of the most electrically, remarkable blue pigments I have ever used and shadows contain fine glitter fragments that appear mesmerizing under lights. Since Paranormal is my favorite shade I could not wait to try it! 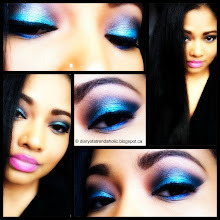 This deep blue definitely stands out and many women stopped me to inquire about this color. 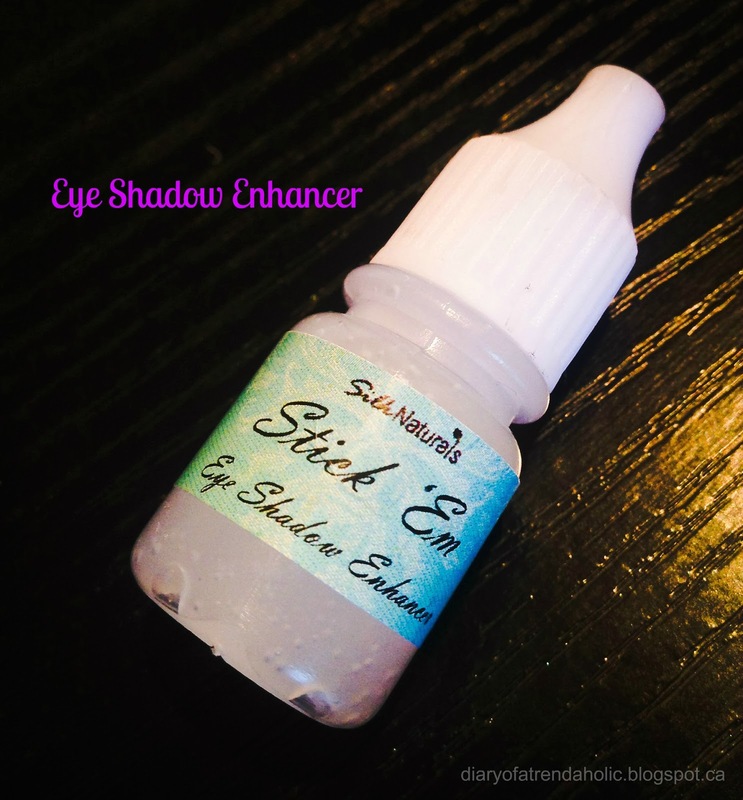 Before application I primed my lids with the Stick Em shadow enhancer by Silk Naturals (reviewed below). 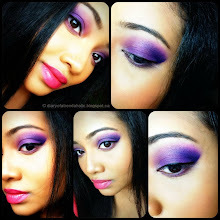 I also used the color Aubergine right above my crease and blended it well to create a faded effect. 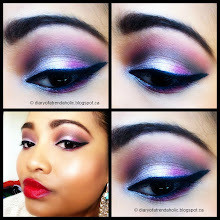 I lined my lower lash line and highlighted my tear duct area with the color Ruffian. The eye shadow enhancer is a gel primer that intensifies each shade and makes them stand out and last longer. The gel goes on clear and wet and dries quickly. A little goes a long way and although I do have other shadow primers I like how the Stick Em enhancer works with these particular shadows. 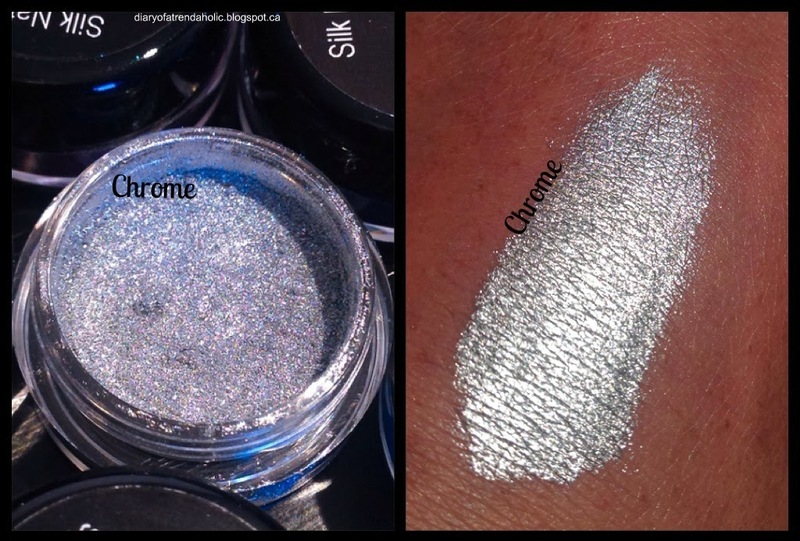 This primer is only $4.99 and a must when working with such gorgeous shades. You can find it HERE. 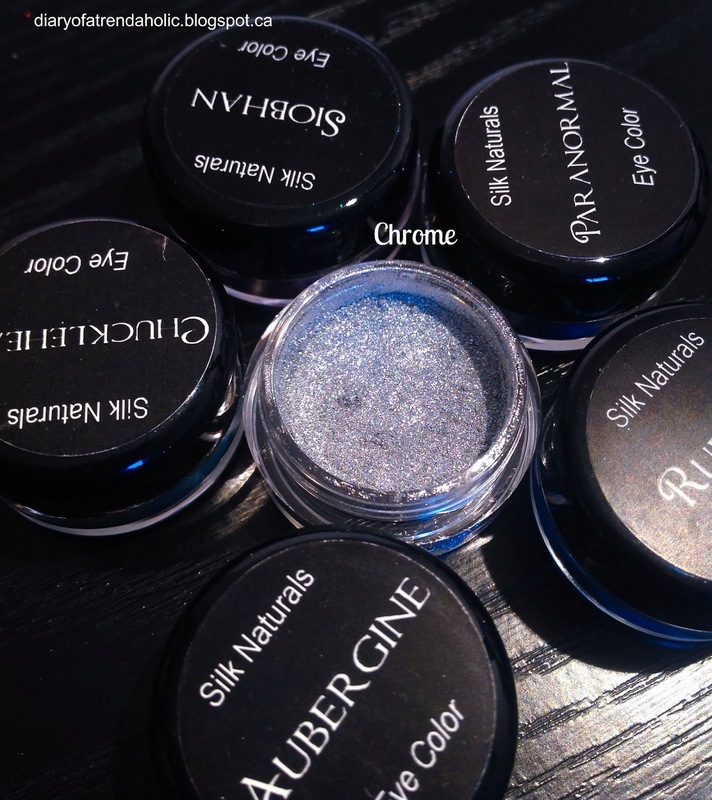 Silk Natural also offers Chromatic Cream eye shadows that come in a tube with a gloss-like applicator. 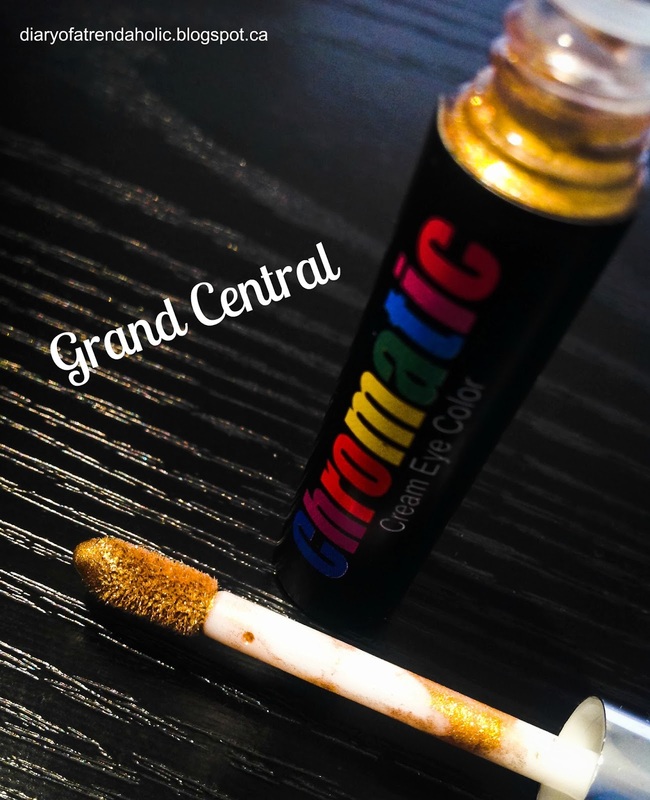 I received the color called Grand Central which is a saturated foil gold shade. 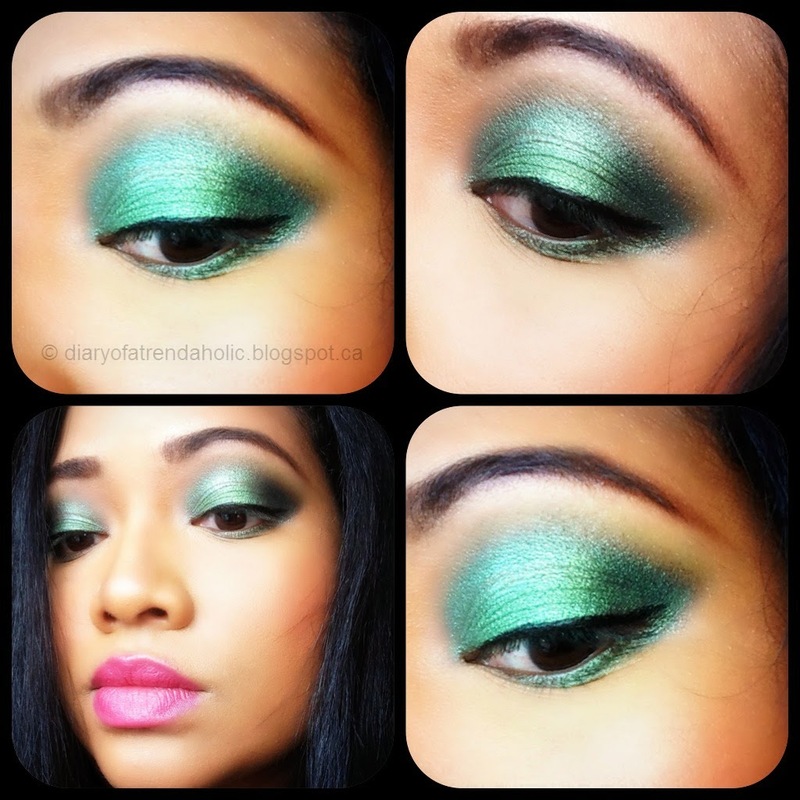 The cream eye shadow applies very wet and highly pigmented but dries matte. You do have to be careful with how much you apply because one drop spreads and covers a lot of surface. 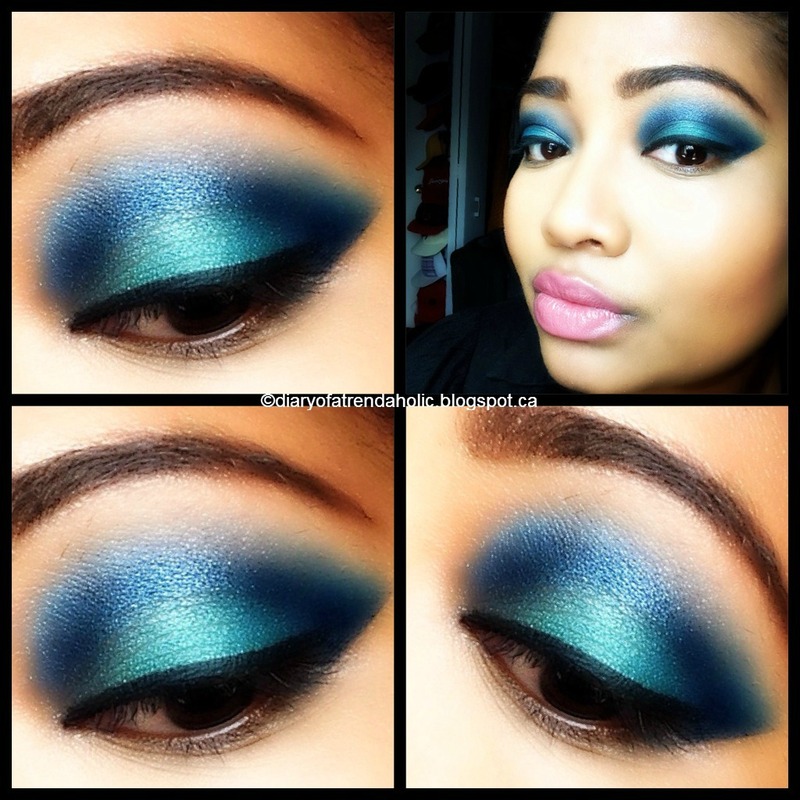 The wand is not my ideal method of shadow application and I do have to use my finger to blend and smooth. Once dry the color does not transfer and stays put all day! The creams come in 24 pretty shades which you can find HERE. They retail for $4.99 each.